Two longtime local businesses in the community recently presented plans for their newly expanded facilities to the Southern Pines Town Council. Sandhills Pediatrics is developing a 2.3-acre site near the intersection of Morganton Road and Brucewood Road, behind The Pavilion building. 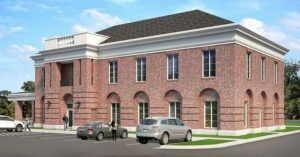 The new 22,600-square-foot medical office building will nearly double the clinic’s number of exam rooms, from 24 to 42 rooms. Plans also call for a small outdoor play/waiting room and 115 parking spaces. The property is part of the 116.7-acre Morganton Park North development where the new 800-student Southern Pines Elementary school is now under construction. A traffic impact analysis was conducted as part of the application process for the pediatric clinic, but no road improvements are required. proposed new two-story building near the intersection of Morganton Road and old U.S. 1. The site is part of the former Bill Smith/Crossroads Ford Lincoln dealership. The proposed new bank building will offer more office spaces and easier access for customers. Plans call for a drive-through and parking lot entrance points on old U.S. 1 and Bell Avenue. The new all-brick facility will face the former dealership showroom.